+++ FedEx®Express and Combined Shipping available for 2 or more products. +++ Contact us to get shipping discounts. 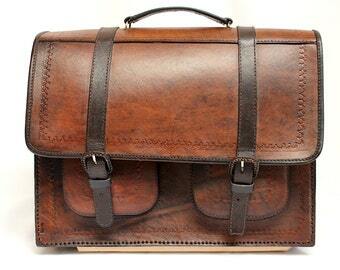 Handmade Briefcase of genuine leather craftsmen were sewn carefully. One main compartment divided in 2 sections. One front flat pocket with zipper. One front pocket with 2 pins. 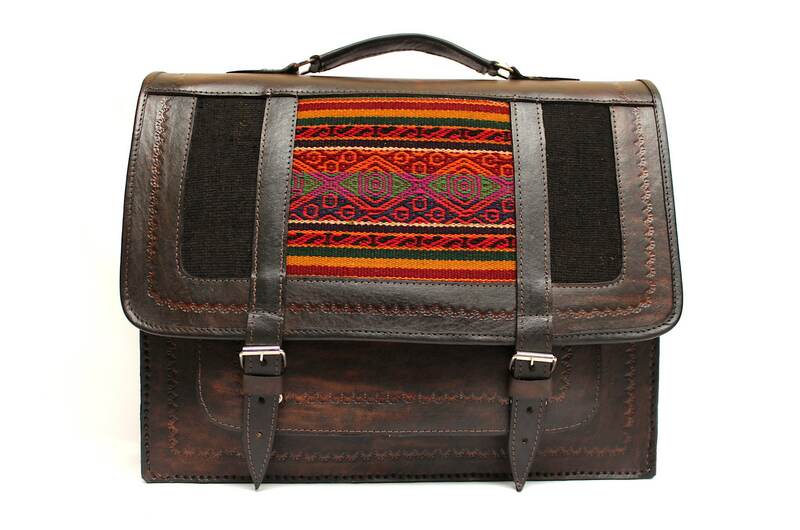 Aguayo cloth embossed edging and front part is traditional fabric designs of Andean People (Inca Culture) in Bolivia, Peru - South America. 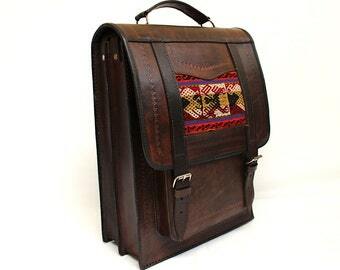 Material: 100% Genuine Leather and Aguayo cloth (Traditional Fabric from Andes) made of wool. NOTE: Because this pouch is made of artisan people, the combinations of color of the typical design and the typical design that adorns the product can have some variations. CONDITION: New with tags and generic box because of its artisan made. - USA, EUROPE, JAPAN and Worldwide shipping is available. - Combined Shipping is available for 2 or more items. Feel free to contact us to get shipping discounts. - FedEx®Express is available in shipping options at checkout and you also can contact us to get FedEx®Express discounts. - Standard Shipping uses Registered Airmail with Tracking Code to be delivered by your Local Post Office in your Country. An aguayo is a rectangular piece of cloth used in traditional communities in the Andes of Ecuador, Peru, Bolivia, Chile and Argentina. 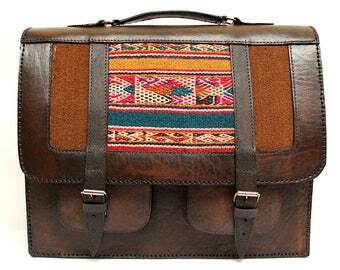 The aguayo is most associated with Quechua and Aymara culture but is not exclusive to them. Aguayos typically features colorful stripes interrelated with rhombuses and other figures with symbolic values. 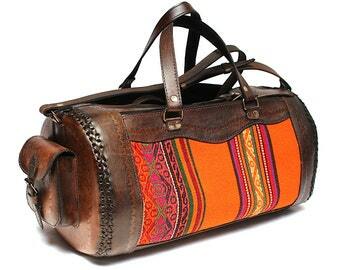 Quechua and Aymara women often use them to carry children and take products to the market. The Aguayo is a native textile made by native indigenous women, it is difficult to create and done using primitive methods. These native Aguayos are done using alpaca, sheep or llama wool, which are colored using natural coloring with bright colors. Each of these Aguayos tell the story of a community or includes symbols which are original to their culture using colors, techniques and designs which make each community different from the others. Currently, artisans are creating Aguyaos with cotton fibers, these are no longer done by had but instead using industrial methods. These cotton Aguayos are used to create bags, table cloths, bed cloths, etc. which are sold in the handicraft markets and are bought by locals and tourists. Thanks for the bag !! The wallet arrived today. It is quite lovely! Shipping takes a bit longer than expected but it was definitely worth the wait! Beautiful durable fabric. Thank you. 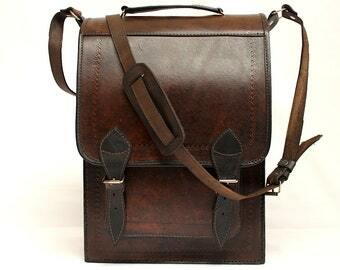 Feel free to contact us for wholesale information. 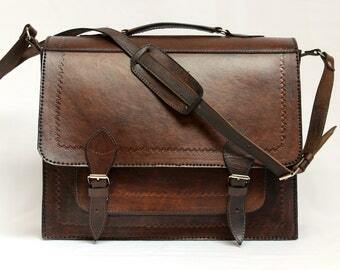 Feel free to ask for any personalized order that you require. According with your requirement and products we will let you know the options of personalization. Feel free to contact us for any question about size. We will work together before ship the products to ensure the size fit your requirements.